An igloo can actually save the lives of people who live in extremely cold weather or who may get caught in snow. If you know how to build an igloo you can substitute it for the place of a tent if you like to camp in snowy far off places. You can make an igloo just for fun to show off your building skills. 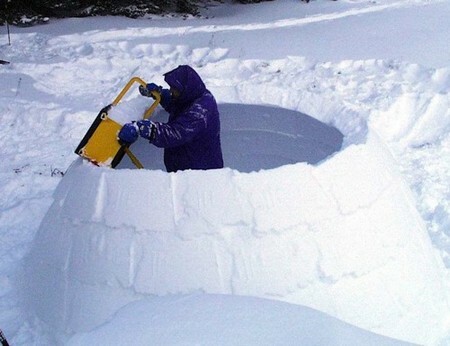 Here is how you can build an Igloo. Continue reading to find out how. Locate an area with a few feet of hard packed snow. The top layer doesn’t matter. The lower layers need to be hard and icy. Dig a pit to cut blocks of use from. Use a saw to cut blocks of ice the same size. Place them to the side as you cut them. Cut the blocks as big as you can carry. Outline the shape of a circle. Place the blocks of ice all around it. The blocks need to lean in 15 degrees. You can trim them with a hatchet. Arrange the next row of blocks on top of the first, staggering them, Trim and shape each row to make them lean in toward the center. As for help with this step. Have the person helping stand inside the igloo with a shovel. Ask them to remove the show from the floor of the igloo. Do this before the walls of the igloo are too tall to discard the snow. Have the person helping you trim the last block with a hatchet and place it into the last open space in the igloo. Cut the entrance out in a semi-circle. This should be downwind. Remove any snow around the entrance so that you are even with the floor. Make a tube lie structure at the entrance so hold the snow and wind out of the actual igloo. Use other snow to pack the spaces between the blocks. Do this inside and outside the igloo. Make the structure as airtight as you can get it. Cut a few of small holes into the top of the igloo. This allows some air to exchange. You don’t want to run out of oxygen in your igloo. Smooth the inside of the igloo. The smoother the inside the less it will drip water. You can heat the inside of the igloo slightly to help with this. It will freeze over with the temperature decrease.